Bouillabaisse is a mixed seafood soup dish flavoured with herbs and spices such as saffron, basil, fennel and orange peel. A traditional stew that originated in Marseille, France. The term bouillabaisse came from the Provencal Occitan words bolhir (to boil) and abaissar (to reduce heat). Traditionally it should contain at least three kinds of fish; it should also include a shellfish and another type of seafood like sea urchins or octopus. Vegetables can be added like leeks, celery, potatoes and onions then it is served with rouille and a bread toast. 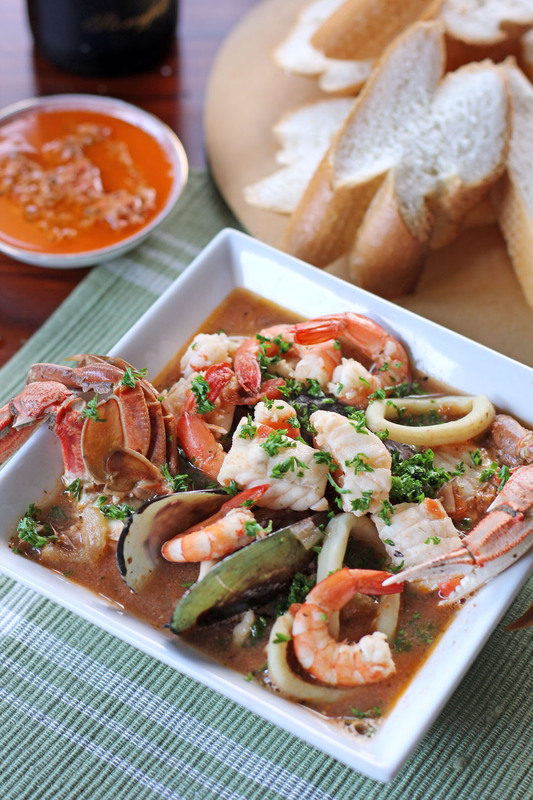 This wonderful seafood dish had originated way back in 600BC when the Phoceans (Ancient Greek people) serve this dish called “kakavia”, a descendant of what we call now Bouillabaisse. The present dish though was invented by Marseille fishermen where they created an easy cheap meal out of common bony fishes and shellfish to be consumed after a day’s work. Traditionally it was cooked in a big cauldron filled with boiling sea water with some garlic and fennel; the tomatoes were added in the 17th century after it was introduced to America. In the 19th century this dish gained popularity to upper class people of the society where it started to get more refined and saffron was added. So it spread from Marseille to Paris then the rest was history. I love my seafood and this is no different in fact this a hot bowl of this dish would be heaven for me, all of the sea creatures in this dish is so flavourful I have to write my name in a piece of paper before scooping out that wonderful broth otherwise I will forget it. Well that last statement is not quite true that’s just an expression in the Philippines if you are eating a really wonderful dish, they said if it’s so good you will forget your name and all that remains is the memory of delicious food you had tried. In a large pot add oil then sauté onion, celery, fennel and garlic in low heat for 4 minutes. Add tomatoes, tomato paste, wine, seafood stock, saffron and orange zest. Bring to a boil then simmer for 5 minutes. Add the mussels and clams is you are using one then once shellfish opens add fish fillets, prawns, crabs and squid. Simmer for 3 minutes at the max. Season with salt and pepper then turn the heat off. Mix all rouille ingredients then place on a small bowl. Serve Bouillabaisse with toasted bread and rouille. Grill red capsicum over open flame until it’s lightly charred. Place all ingredients including red capsicum in a food processor and pulse until it form a smooth sauce. Crumble the bread, moisten it with hot water (or the bubbling broth if you're preparing a fish soup or bouillabaisse), and press it into a tight lump, squeezing out the liquid. Add the bread lump to the paste and beat, adding olive oil, until you've raised a smooth sauce. If the sauce tends to separate, add another tight lump of bread and hot broth, and keep beating. Such a flavourful and enjoyable meal. Beautiful dish Raymond!!! The last time I had this dish I was on the French Rivera in the fall of last year. This is one dish that is so memorable and so worth the wait. Needs lots of french bread to soak up all of your delicious juices. thank you for sharing.. need to try this dish, seems so easy to prepare..
Bouillabaisse is certainly a dish to get lost in, discovering new deliciousness in every bite. Fabulous photo! I love to read your posts because they are informative and also to look at the diverse and beautiful dishes that you share here. What a tempting Bouillabaisse!!! You did a great job again, Raymund! Bouillabaisse hmmm I wonder why I cannot pronounce this!! do you pronounce the Ls or it is silent … forgive my ignorance Raymund :). I love sea food and always looking for new ways to introduce it to my family. Thanks for the hearty dish. Oh, I would love to try this dish in Marseille. But until then, your version looks amazing. Crabs are a big a deal where I come from but don’t seem very common eating here in NZ. Where did you get yours from? After being in Hawaii with tons of fresh shrimp, this looks mouth-watering! I love French bouillabaise – the authentic one! But I can’t deny that I also lose the Filipino version…with cream! LOL! This looks fantastic and I am soooo ready to eat this! Gosh, I love the looks of all that seafood! 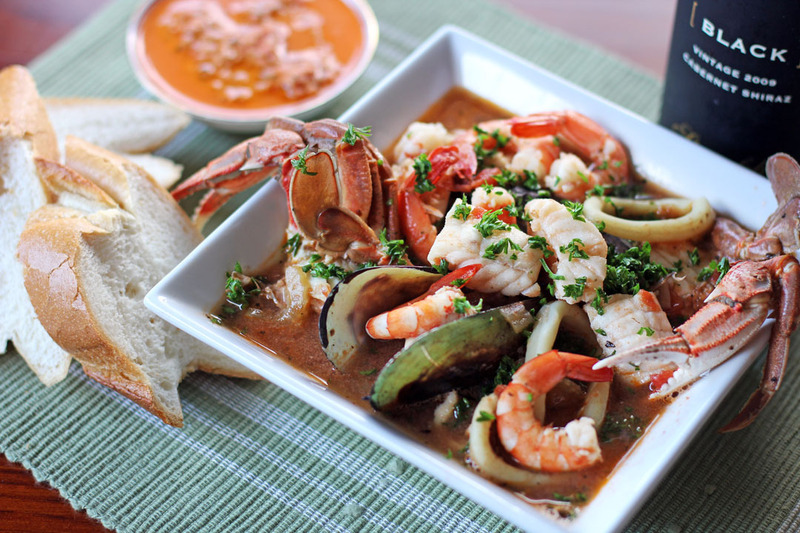 Great dish – it’s been awhile since I’ve had bouillabaisse, and now I won’t be able to get the thought out of my head! What a luxury to include sea urchin in a dish like this !! I love bouillabaisse – I posted about it a couple years ago I think. It’s got such a lovely distinctive flavour and the rouille with some nice bread is just the perfect accompaniment isn’t it? Some recipes call for such outrageous amounts of saffron – you don’t need much at all to give it that subtle flavour!